Moonrunner's a good one. You're a bounty hunter, but not named, so you can pick one, I guess. Is anyone here not going to pick Boba Fett? No? Okay. Let's move on. Mr Fett has to track down the last big war criminal still bugging the Old World town of Blackhaven, which is in no way a sideways-universe Blacksand, not at all. Except it totally is, but with a more Sherlock Holmes-era London kind of feel. The book's true distinction is letting you pick a bunch of skills from a list, but implementing those skills naturally, and in a way that makes the narrative feel open and enveloping. More on that later. This guy Bennet is giving me the info-dump, and in the very first paragraph he's killed, John Locke-on-Naomi-style - a thrown knife in the back. A quick look reveals who forged it - Alcham Lugosh - which is really useful... not, and I jump out the window in pursuit of the assassin. I spot him talking to a man running a horse and carriage, and disappear. I leap onto the now-moving carriage, and wait. And wait. And soon enough, the jockey drives the whole thing into the "filthy" river. Growing up where I did, I know all about filthy rivers. Anyway, I lost that brand name knife trying to swim out, but being stinky and wet didn't stop some beggar woman trying to chat me up. Beggars can'[t be choosers, I guess. As it's the time of night when even pubs in a hole like Blackhaven are closed, I decide to pay a visit to Mr Lugosh. It's an option, so I guess he's an all-hours knifeman. I should have known better though - it was a trap. Literally - I fell into a pit with 12 dead guys, all missing three fingers. This must be where woodwork teachers and guitarists from Black Sabbath go to die. That, or the New Testament story of the 12 disciples was a rose-tinted version of events. The room starts filling with water, and I reach for a beam above to try and pull myself out. Oh yeah, that's right - Mr Lugosh is some kind of Ginsu fiend, and I quickly find out why so many dudes are missing three fingers. His knife skills are so precise, he makes sure his traps always cut off precisely three fingers - no more, no less, and all on one hand - just enough to make you lose 1 SKILL and a massive 2 STAMINA points. Really? Later in the book I get 'roughed up' by some ruffians, and I lose 2 STAMINA points. What did they do, chop off three of my toes? I escape the pit by floating to the top as the water rises (slap to the forehead), and morning has dawned, so it's time to hit the pub. Not the doctor, the pub. Some trickster is trying to con people into giving him money, so I try to use my own con skill on him. The book only gives me the option of using sleight of hand, which I don't have. This will be a recurring feature. Still, I win, and am loaded and set for the rest of the game. I ask the bar wench about the Cabal of the Werewolf, the dodgy group behind the bad guy's plans. The entire bar kicks out their stools, I assume in a manner I think only David Cross could describe, and eye me up. I repeat my question, and lose that 2 STAMINA I was talking about earlier. It works out though when some old lady professer gives me soup and money, and tells me I need to find these six MacGuffins in order to beat Mr Bad Guy. And only nine hours in which to do it! For some reason. What if I had waited till a reasonably drinking hour to visit this bar? "It is 4pm and... you're out of time! So ah... let's just get wasted." To be fair, the quests to get these six items were quick but interesting. I got to con some orcs (no, I don't need a medal), buy a magic shroud for almost nothing, kill a demon. I also went to the Three Broken Fingers Tavern, which seemed appropriate at the time. I got three of the widgets out of six, and as if by magic - or plot requirements - came across the secret meeting of the Priory of Sion, no wait, the Eternal Fraternity of the Rosy Chalice. Either or. I got gassed, and woke up in a coffin. Uh-oh. I wouldn't tell Mr Bad Guy what I knew, so had my face eaten off by rats. Once again, sleight of hand would have been handy, somehow. I guess it extends to sleight of face? Was a good read though. Yes, rats eating my face killed me. I liked the author Stephen Hand's other FF book, Legend of the Shadow Warriors, too. Anyway... the latest issue of Fighting Fantazine is out, issue #3, PDF download with loads of Fighting Fantasy goodies. Check that out, and if you need some sounds to listen to while you're reading it, I've got a new album out under my Radio Over Moscow banner - it's called 'Hide the Decline', and you can download it free or chuck me $5 and have a dynamic, less compressed mix of the album and bonus goodies. Dan I have the Fabbled Lands gamebooks , have you ever played? No - haven't heard of those ones. Good? Dan, were you able to read the 'poster' which was opposite reference #39, in the Last Octopus pub? Must be my ailing eyes, but I could hardly make out any of it. Something about 'Rose Chalice'? The thing says not to read the text, but to just read the poster. Is it important, or another silly red herring? Fabled Lands is a great series of gamebooks , I can send you the first book so you can check it out . Great job on the Fighting Fantazine , I always read your article there. 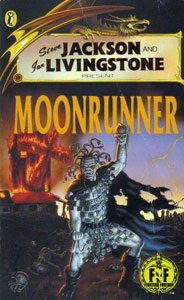 Moonrunner is one of my favourite of the original series. The Hammer Horror feel throughout is brilliantly realised. The windmill... the fire.. THE REVENGE!!!!! This is flat-out one of the best-designed (structurally) and best-written books in the entire FF series. The skills are meant to work in certain synergies, and only through trial-and-error and a lot of investigation will you find the combinations that work the best. It is impossible to get all 6 widgets, it's part of how it's structured. But you're supposed to be able to get 4-5 of them, before you proceed to the next stage. Yeah, this was great fun. I've revisited a few old FF classics recently, in a nostalgia fest inspired by this blog and by Turn to 400, and this was one of the best. I actually replayed it after winning, just to see how some of the other paths would pan out! Lots of fun side-quests and interesting characters- there's a very funny bit where you can dress up as a vampire to scare two grave-robbers, and there's a tie-in to Legend of the Shadow Warriors where you can meet Doktor Kauderwelsch's son. People above have mentioned Conrad the Maniac Guard, who is a superb character. My only quibble is that, because there are several different ways to get to the final confrontation, the book sometimes starts talking about a character you've never heard of.